Before you can implement any general tactics you need to have developed your own table tennis skills to a reasonable level. So practice, practice, practice is the key to success. There really is no substitute for practice if you want to improve your table tennis skills. So it's vital that you master the four basic strokes before you start thinking about tactics. You see, tactics are only useful if you're playing against a player of a similiar standard to yourself, even if they're slightly better than you. But if you're playing against a player who is at a much more advanced level than you, then it's unlikely that any tactics you employ will be effective, because the difference in playing standard will negate any tactics which you try to use. When you've developed your own table tennis skills to a reasonable level, you can then decide how to use these skills in a match situation. One of the best general tactics you can use is to play to your own strengths and try to impose your game on your opponent. This means that you need to try to implement tactics which make use of your strengths. So if your best shot is a forehand drive, you need to try and use that stroke as much as possible. But if you're a defender or a counter-hitter / blocker, you'll want your opponent to play faster, longer shots which will enable you to use your defensive strokes more effectively. So you need to determine what strokes you can play early in the rally which will cause your opponent to play the type of return which will enable you to use your best strokes. 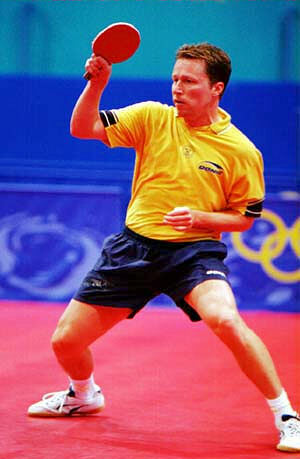 In modern table tennis the offensive / attacking style of play is the most dominant, so this means that most players will try to initiate the first attack, rather than allow their opponent to initiate the first attack. This is because the player who attacks first usually gains the advantage and is more likely to win the point. The "third ball attack" is therefore the most commonly used tactic by the top players. "Third ball attack" just means that when your opponent returns your service, you play a strong attacking stroke (on the third ball / stroke of the rally) which will either win the point outright or put you in control of the subsequent rally. So if you're able to develop several different ways of serving which enable you to use a third ball attack, then you'll be able to attack first more often. However, you should also be looking for the opportunity to attack first in every rally. So in order to do that, you need to play the ball to your opponent in such a way that they cannot attack it, but that they return the ball in such a way that YOU can attack it. This usually means that you have to keep the ball short and low over the net using varying amounts of backspin. By doing this, your opponent will have to lift the ball in order to counteract the backspin and so is more likely to play a longer return which you can then attack. Therefore it's a good idea to practice playing the first attack by practising your "third ball attack" with your training partner. So practice serving to your training partner and get them to return your services either short or long. You must then try to attack whatever shot they play. For more detailed information about how to improve your service and how to serve in order to help you attack first, see my book entitled "Service Secrets".